What would you do with 11 years? Check a few more things off your bucket list? Spend more time with your kids (and grandchildren)? Take a trip to some exotic places? New research on women and smoking found that women who smoked a pack a day reduced their life expectancy by an average of 11 years. British researchers followed one million women now in their 60's and 70's who had been smoking since their teens in the largest study released on women and smoking. 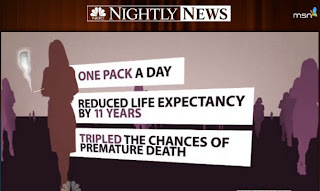 Even women who are just social smokers or who only have a few cigarettes a day double their chances of dying younger. And if you smoke your entire life, you are highly likely to die as a result from some sort of smoking-related illness such as heart disease or cancer. But there's good news too! The study also found that even if you started smoking as a teen and you quit by age 40, your risks drop by 90 percent. Even if you stop smoking by age 50, your risk drops by 66 percent. No matter what your reasons for quitting are, we hope you are successful. Then tell us what you want to do with those 11 years. . .